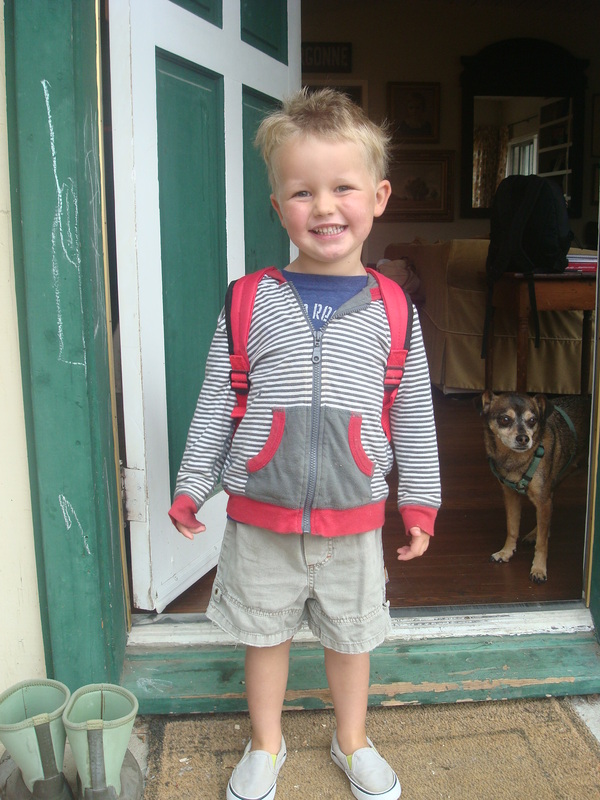 First day of school photo fail. Today in our school district, thousands of kids are going back to school. My own two are starting preschool – Seabass in his second year, and Sweet Chuck her first – and we’ve all looked forward to a fresh start. But while so many kids posed with a sign announcing their first day of ____grade, mine were doing this. Hard to tell what’s going on there? Allow me to explain. I was rushing off to work at 7am (my new start time, which gets me enough hours to pay for their rather expensive preschool, which is held only from 9-noon) and Jake was handling breakfast. Sweet Chuck had a leak in her overnight diaper so I made the split decision to change her into her first-day-of-school clothes and take a picture for posterity. You know, on the front porch, all Americana-like. As anyone with two small children knows, however, whatever you do for one, you must also do for the other. So I tiptoed on eggshells to convince Seabass to change into school clothes in preparation for a photo. I tell ya: the amount of energy I spend on selecting the right words to a) not upset him and b) get what I want out of him could power an offshore oil rig. “I DON’T WANT SHOES!” Weeping, moaning. “I WANT FLIP-FLOPS!” Gnashing of teeth. Flailing. And that’s how this photo came to be. I told him I just wanted a picture to document his first day of the last year of preschool, and he threw himself on the threshold of our house, crying for who-knows-what reason. In a flash of inspiration, I took the shot anyway because, if we’re documenting reality, this more than captures life around our home at the moment. Meanwhile, you’ll notice Sweet Chuck decked out in puffy piggies, jeggings, and pink cowboy boots. That girl was ready for action. 1. Life ain’t clean. I’d love to have a cute chalkboard or sign announcing my kids’ first day of school for a picture in a scrapbook I actually end up making for them. And, by the by, I’d love it if they were smiling in that picture. 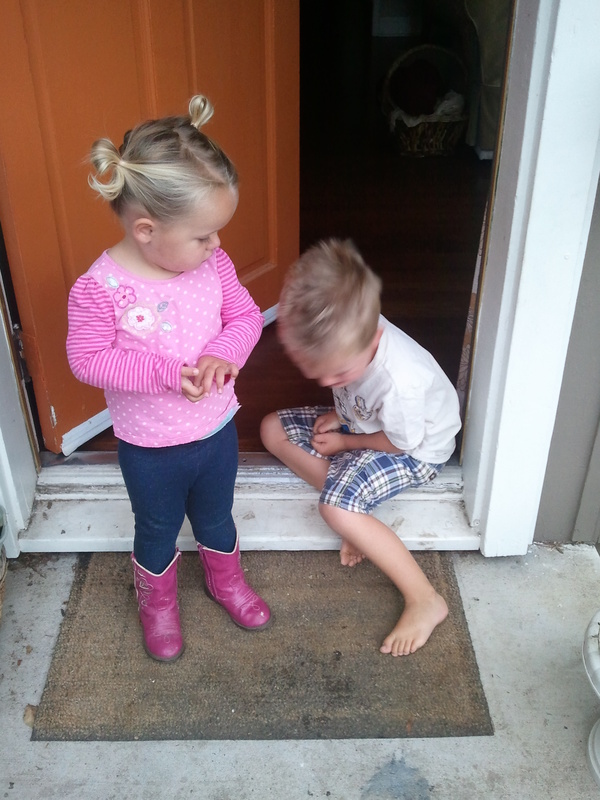 But this is what’s up right now: crying, shoeless kids. Maybe next year he’ll be smiling again. And who knows? Maybe Sweet Chuck will be a wreck. 3. There’s nothing wrong with walking away. For the first time since Seabass was born, thanks to preschool, I am now working three mornings a week. To some moms this might seem like a piddly-diddly amount of time away from kids, but for me it’s an awful lot. I’ve spent years nursing, wiping butts, and catering to the demands of young kids at home, but today is the first day that I’ll be doing less of it, three days a week. And THAT is why I gave up on a perfect first-day-of-school shot, grabbed my purse, kissed the kids’ crying heads (and Jake’s – yes, he was crying, too), and walked out the door. Here’s to change, messy and complicated as it may be. ← A quiet night at home, just us girls. Pictures of smiles are cute and adorable, but real life is more interesting. I love Sweet Chuck’s outfit, but her look at her brother’s meltdown is priceless. A good friend of mine often talks about finding beauty in brokenness. I think there’s a lot of beauty in letting go… of expectations… of comparison… of who we thought our kids would be or how we want them to act at any given moment. I love this post and the inspiring relief it brings to all of us trying and doing our best but allowing our kids (and us) to just keep trying even when it looks far from perfect. Thanks for having the courage to write this.